The Quinnipiac Bobcats men's ice hockey team concluded its regular season road schedule by cruising past the RPI Engineers 7-3 on Saturday night in front of 4,716 fans at the Houston Field House in Troy, New York. The Bobcats put a damper on the Engineers’ 40th annual “Big Red Freakout”. After spotting the Engineers and early lead, four unanswered Quinnipiac goals proved to be too much for RPI to overcome. It was RPI's Will Reilly who opened the scoring a little more than four and half minutes into the game. Riley Bourbonnais and Mike Prapavessis each picked up an assist on Reilly's goal. Just under three minutes later the Bobcats started their barrage of scoring in the first period. Karlis Čukste took a Tanner MacMaster past in the zone and wristed a shot from the top right circle past RPI's Chase Perry for the goal. Connor Clifton was also credited with an assist. A minute and a half later it was Landon Smith sniping a shot past Perry from the edge of the bottom right circle. MacMaster and Derek Smith picked up the assists on the goal. Seven minutes later freshman Nick Jermain put a shot on net that Perry had trouble handling that eventually found the back of the net. It was his third goal of the season while Kevin Duane and Derek Smith were credited with the assists. Two minutes later Landon Smith potted his 8th goal of the season and second of the game on a mini breakaway. Kevin McKernan and Tommy Schutt picked up assists on Smith's goal which concluded the scoring for the first period. Quinnipiac out shot RPI 17-9 in the opening frame. Midway through the second period Kevin McKernan took a cross checking penalty putting the Engineers on the power play. Less than a minute later RPI cut the lead to two on Jacob Hayhurst's power play goal from Will Reilly and Mike Prapavessis. Seven minutes later Connor Clifton ripped a shot from the point that redirected in off of Bo Pieper and past Perry for the goal giving the Bobcats a three goal lead once again. 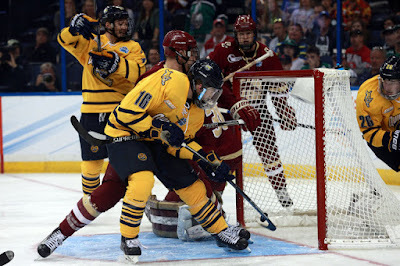 In the third Quinnipiac continued to pour it on as Chase Priskie skated in the lower right circle before firing a wrister past Perry for his 8th goal of the season. McKernan and Schutt picked up assists on the goal. Midway through the final period RPI's Alex Rodriguez scored his first goal of the season to get the Engineers within three goals. Things got testy late with less than six minutes left when a brawl broke out leading to four misconduct penalties along with a game misconduct for Karlis Čukste. Kevin McKernan sealed the game with an empty netter with less than two minutes to play. Priskie and Scott Davidson picked up the assists on McKernan's goal. The teams finished the game with a combined 85 penalty minutes. 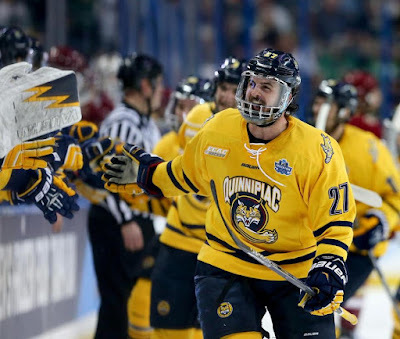 Quinnipiac out shot RPI for the game 37-24 and had seven players with multi point games. Andrew Shortridge made 21 saves for his seventh win of the season. The Bobcats improve to 17-13-2 (11-8-1 ECAC) while RPI drops to 7-25-1 (5-15 ECAC). 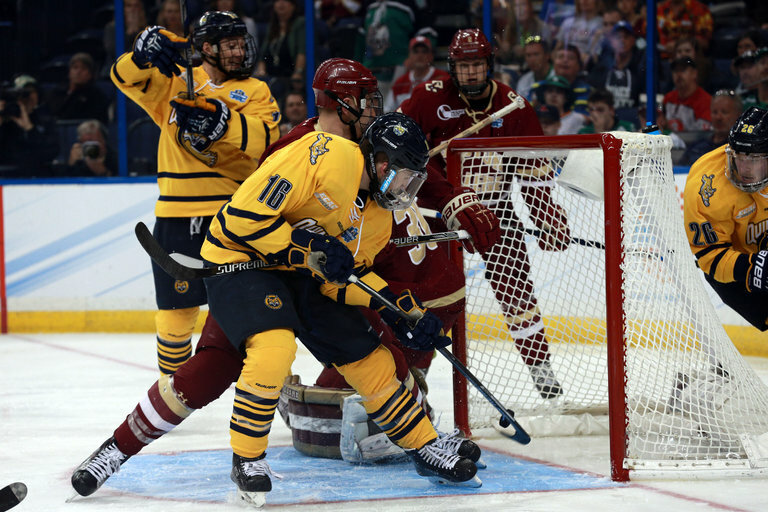 Quinnipiac now returns home next week to conclude the regular season against Yale and Brown with an outside chance at still securing a first round bye should Saint Lawrence lose both games and Quinnipiac win both games.